Matchroom Boxing head honcho Eddie Hearn claims that Kell Brook 38-2 (26) always thought the proposed grudge match with Amir Khan 33-4 (20) would never take place due to reluctance on the Bolton boxer’s part. Khan, 32, walked away from negotiations for a Brook fight in the UK in favour of a world title challenge to WBO welterweight champion Terence ‘Bud’ Crawford34-0 (25) that will take place in the United States on April 20 at a venue to be determined. “I maxed out on offers for Amir,” said Hearn, who promotes both Khan and Brook, to iFL TV. “Fans are disappointed. I am not over the moon he took the fight but he’s fighting Terence Crawford who on paper is better than Kell Brook. “I am p***ed off but I am not raging. I could not have done any more for myself and British public. The worst kept secret in boxing was revealed at a press conference in London on Tuesday when it was announced that Crawford would defend his world title against Khan, leaving Brook to negotiate offers from former WBO 147-pound champions Jeff Horn 19-1-1 (13) of Australia and Jessie Vargas 28-2-2 (10) of the United States. The Sheffield fighter is coming off a lacklustre performance against Australian Michael Zerafa 25-3 (14) in December. 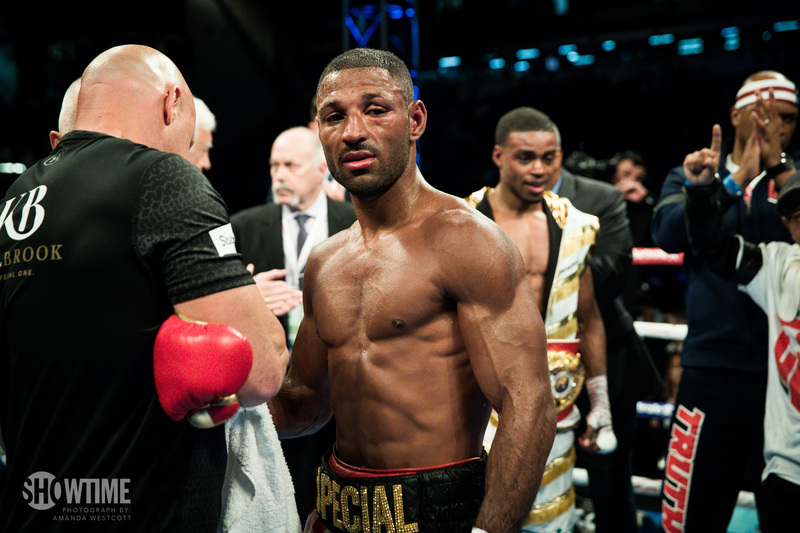 Despite winning comfortably on points, the fight was more competitive than expected with many pundits wondering out loud whether Brook, 32, has seen better days. The eternally optimistic Hearn admitted a Brook-Khan fight would lose some of its shine if the British boxer loses in America but hasn’t written off the fight happening at a later date. “If Amir wins, then it ain’t dead. If he loses well, it ain’t dead. Whatever happens, unless both have spectacular wins, it’s not big as it is now,” concluded Hearn.